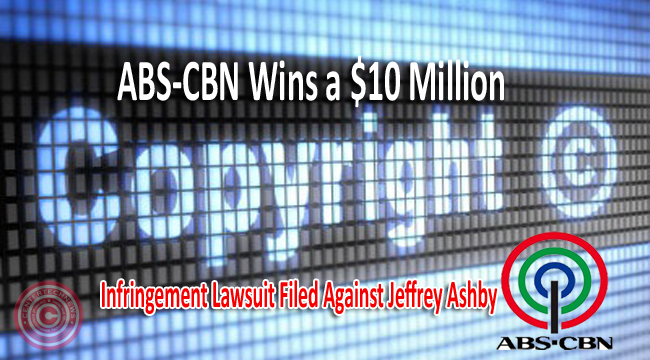 ABS-CBN wins a $10 million copyright infringement lawsuit that had been filed against Jeffrey Ashby as decided by US court in Oregon. Ashby was ordered by US Federal District Court in Oregon to pay the Kapamilya network a sum of $10 million for the damages he had done to the broadcasting company through copyright infringement. Ashby was reported to also have pirated the ABS-CBN’S TV shows and movies on video streaming websites in his various sites such as pinoytalaga.com, watchfilipinomovies.com and watchfilipinotv.com. These site are famous to overseas Filipino who likes to catch up with the Kapuso TV shows. According to Asso. Vice pPesident of Global Anti-Piracy for ABS-CBN International, Elisha Lawrence. They had been pursuing a number of pirates and Ashby is the first among them. She also added that they had been pushing a campaign to rally against the pirate websites since numerous had reached them that the said sites contain certain malware which could case harm to the site users. If infected with a malware, the pirating sites can be a way to steal identity of users, and the valuable financial information. Users might also be subject to phishing attacks. In a statement released by Jeffrey Ashby, he warns fellow website owners who publish the network’s content without its permission to stop operations immediately. Furthermore, he said that continuing to show the Kapamilya network’s TV shows and movies will only lead to very serious consequences.